After moving here, we had to get use to the way Italians eat. Dinner is super late. Lunch is enormous. And breakfast, as we know it, is non-existent. We say it’s the most important meal of the day, but Italians don’t eat when they wake up; they drink coffee from their espresso machines or brew some in a tiny coffee maker at home. If coffee isn’t enough, many have a cigarette along with it. It’s not until 10 or 11 am when the cafes open that Italians take a break from their morning and get a bite to eat. But there are no breakfast menus. No eggs Benedict. No oatmeal. No bacon. Just pastries. And here in Italy, powdered sugar donuts and huge cinnamon rolls aren’t just for kids. Men in business suits eat whipped-cream filled croissants all the time. It’s 11:00 and the cafes are busy. We haven’t entirely acclimated to this routine yet. Once in a while I’ll make breakfast for the kids. When some local friends heard about this, they wanted to know more. What is a traditional American breakfast? We got to talking and then decided to have them over for Sunday Brunch. It took a week of planning and experimenting before we settled on the menu. I wanted something with syrup. And Matt wanted to include savory dishes. We bought all sorts of ingredients in our search for the perfect flavors. Since Italians don’t have breakfast meats like bacon, we bought an assortment of cured meats and sampled them all throughout the week. Pancetta was too salty, so was guanciale. We tried prosciutto crudo, prosciutto cotto and speck (smoked prosciutto). Eventually, speck won the vote. On Sunday morning we woke up early to start squeezing oranges. 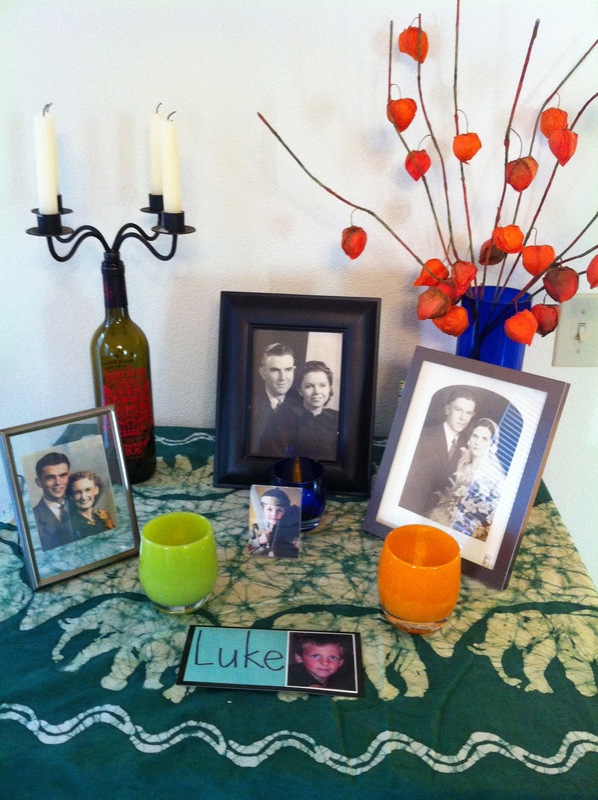 By the time our guests arrived, all was nearly ready. We had just a few frantic minutes with the oven and all four burners on at once trying to cook and talk in Italian while appearing in control (too difficult). I finally abandoned the cooking part and Matt took over. French toast cooked in lots of butter. As we were eating, we talked a little about a typical Sunday at home: hanging out, watching football, going on a walk, barbequing, etc. 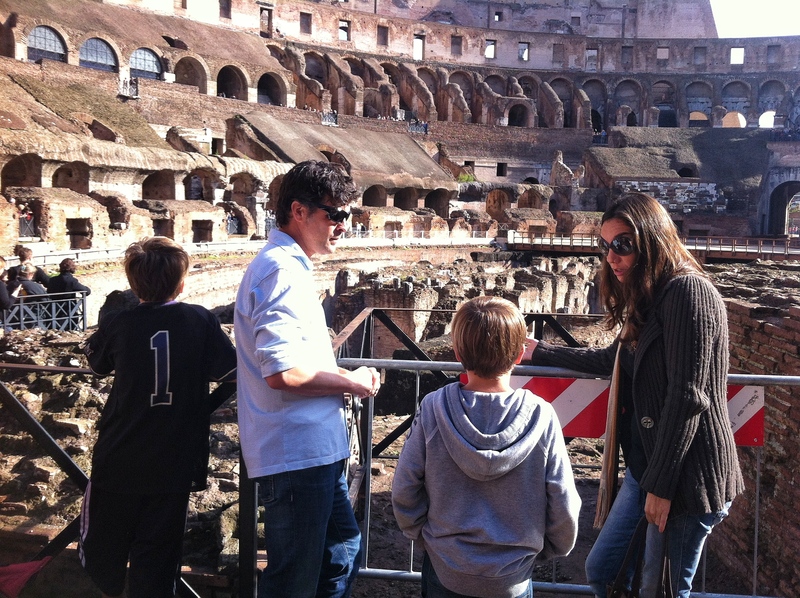 However, since we are in Italy, Milena and Sergio proposed a visit to a nearby ruin. This sounded perfect, albeit in great contrast to an American Sunday. So after we finished brunch, we walked down the street for a tour of the 2000-year-old Etruscan acropolis that was discovered underneath Perugia’s giant cathedral in the 1980s. It was just opened to the public this year. The oldness of it all was mind-boggling. 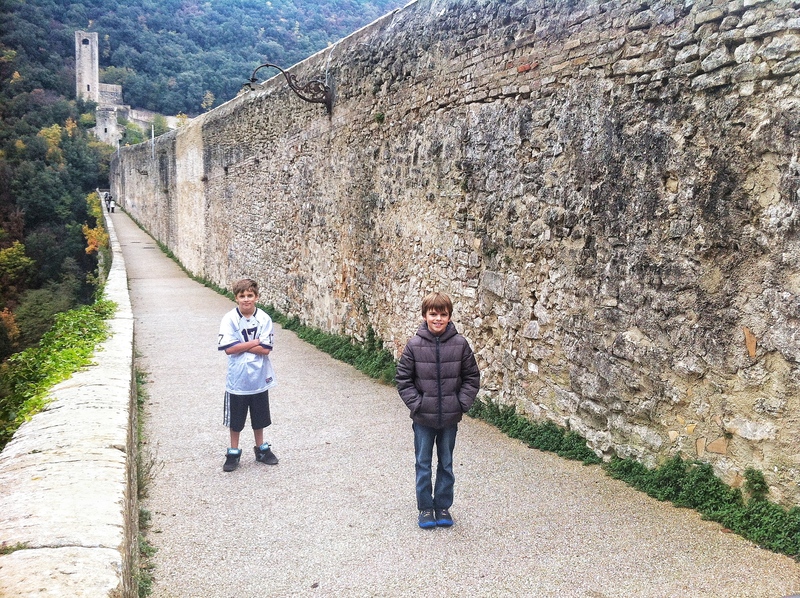 During our tour, we walked up and down ancient roads that had been buried for two millennia. We stood in the remains of an Etruscan family’s house. 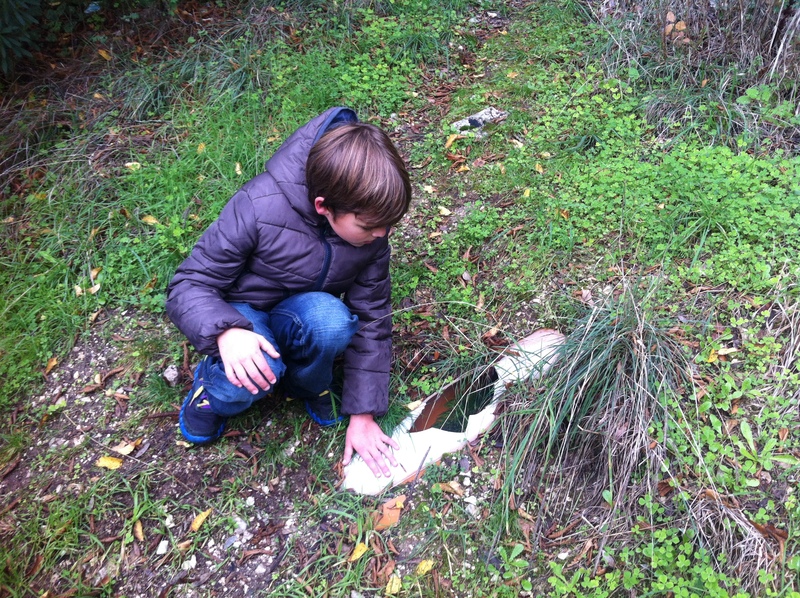 We saw an ancient cistern for collecting rain water. We touched a tall wall that at one point extended to the highest reaches of the city. All the while, we were just two blocks away from our apartment and just a little bit underneath. 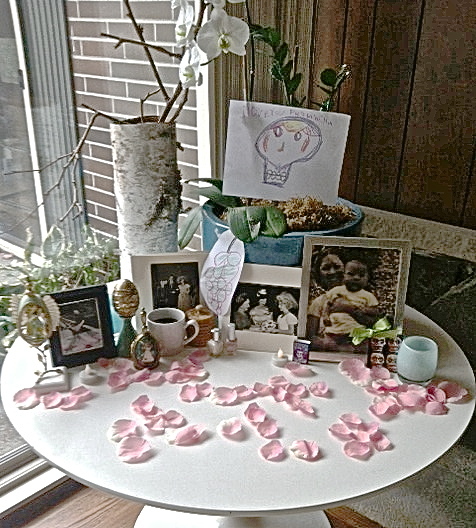 Later, when we got back home, all the dishes from brunch were waiting for us. By the time we cleaned up, we were tired and ready for bed. The last thing we wanted to do was cook dinner. So instead, we walked downstairs for an ice cream cone and a beer, neither an Italian nor American meal. As far as most Italians are concerned, there is only one sport. So when Matt told some friends that he plays golf three times a week, they were curious. What is golf and how do you score a goal? Matt tried to explain the basics, but it soon became evident that in order to fully appreciate the game, they would need to experience it. 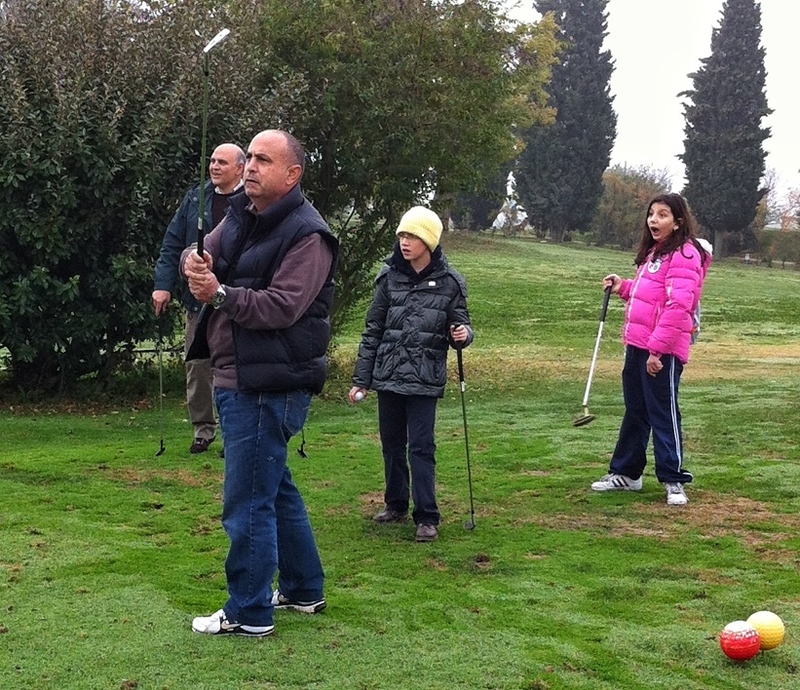 So today he took Sergio, Flavio and Giovanni (and a couple of their kids in tow) to “Golf di Perugia” just 30 minutes outside the city to learn the basics and play the three-hole course. Since we don’t have a car this month, Matt rode his bike. He showed up early so he could rent equipment for them and reserve some space on the driving range. At 11:00, everyone else arrived, and they began the lesson. 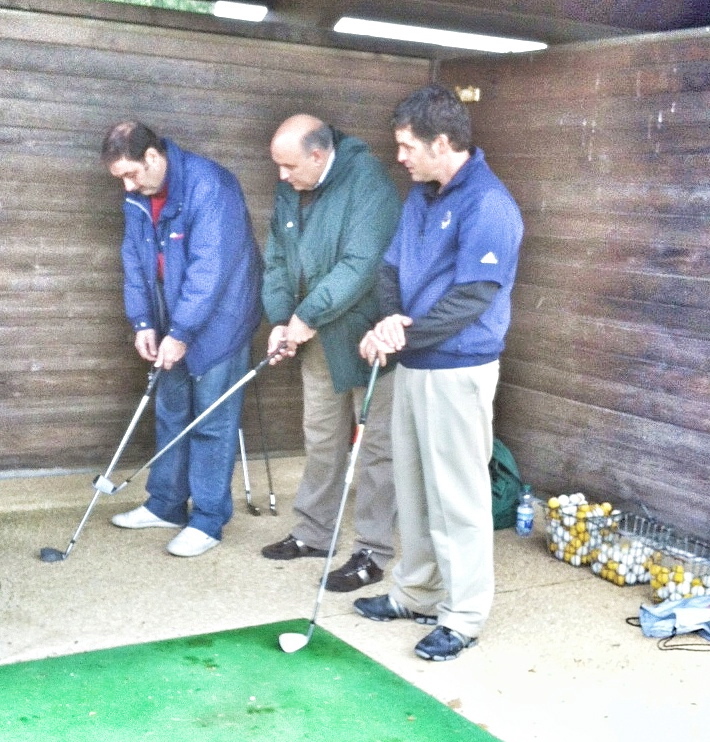 A golf pro was on hand to explain in Italian how to hold a club, how to stand and how to swing with the body. Flavio and Sergio warm up with Matt. Next they headed out to the three-hole executive golf course. 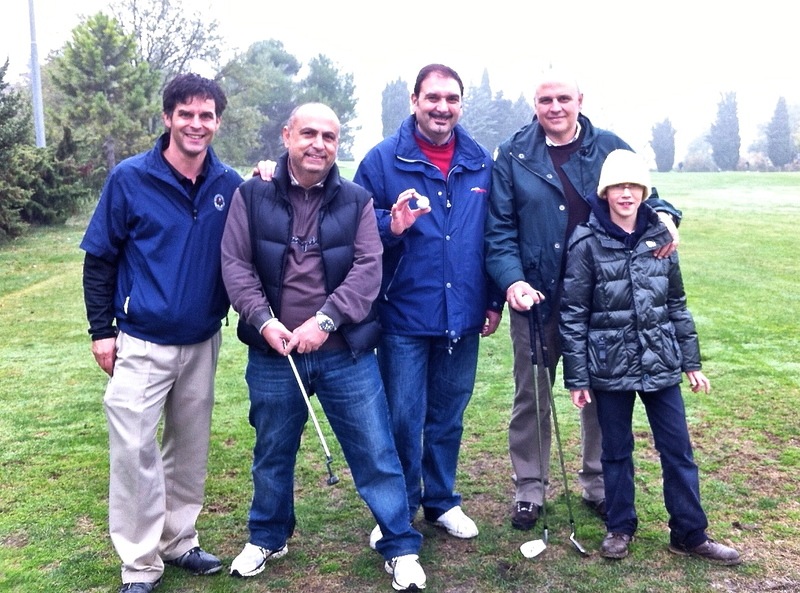 It was definitely a beginner day; however, Sergio played extremely well with a bogey on every hole for a score of 12. Matt held his own with a nine. They kept the golfing under two hours and then found a restaurant nearby to spend the rest of the afternoon. They ordered a huge platter of sausages, pork chops, filet mignon, flank steak with mushrooms, flank steak with artichoke and a bowl of french fries. As they were finishing dessert and their grappa-coffees, Matt asked the guys if they had any hobbies. Giovanni said that his was eating. Before leaving, they all agreed to meet again in January. 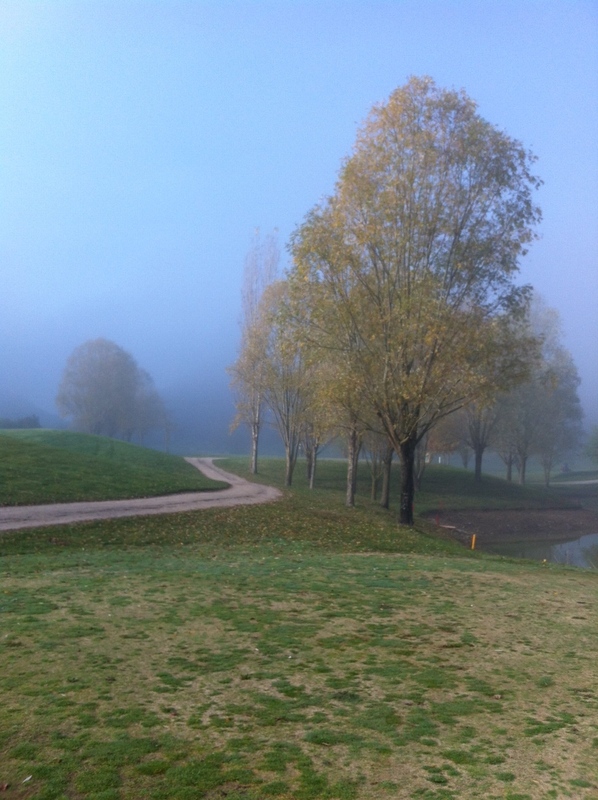 Last week we drove to nearby Spoleto for the night. We didn’t see much, however, because we were holed up in the hotel for half the time helping the boys with homework. Tom had hours of math while Ray was studying ancient Greek history. 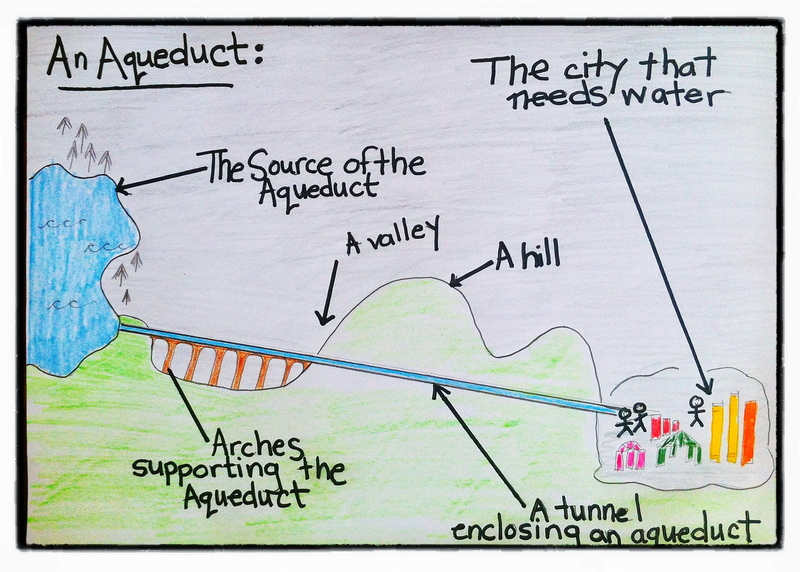 The Aqueduct: I’ve been trying to wrap my head around aqueducts since I first saw one 25 years ago. This week, I finally grasped the fundamentals and cleared up two decades of misconceptions. While I knew that aqueducts somehow transported water to thirsty towns, I never could visualize the process. Why the arches? Where is the water? I thought that maybe the aqueduct worked like some sort of bridge under which water flowed. Then later, someone told me that water streamed up and down the arches in a maze of pipes (and I believed her). Finally, this week, after an afternoon of Google searches, I learned that the arches are just part of the aqueduct (albeit the only readily visible part) whose purpose it is to support the the pipes that transports water. I learned that aqueducts can be many miles long often tunneling underground. I also learned that water doesn’t run perpendicularly under a mulit-arched bridge (duh), but rather along the top of the structure on a precisely constructed, steadily flowing, slightly tilted, downward slope. It’s simply a feat of gravity (and the ingenuity of the ancient Romans) that ensured the success of aqueducts. 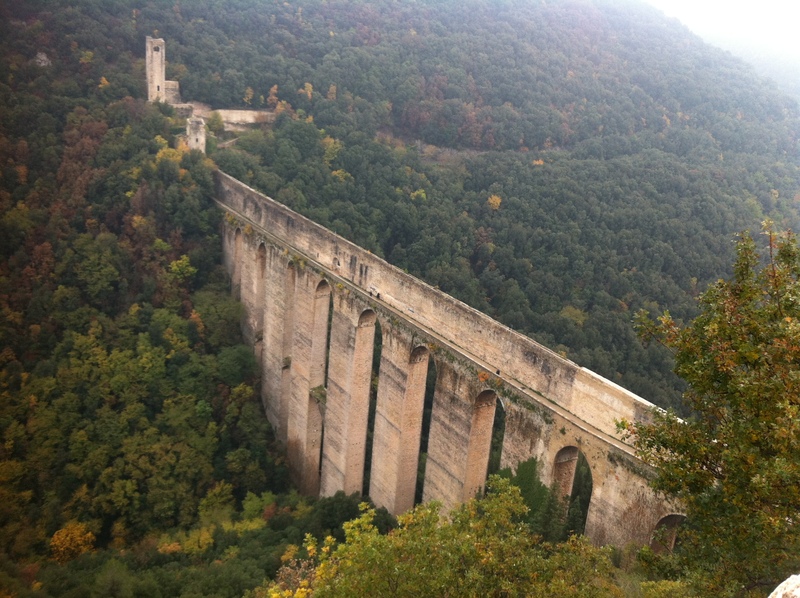 This is Ponte delle Torri, the famous aqueduct of Spoleto and the highlight of our weekend. The structure is 230 meters across with a footpath on top. Unfortunately, at least once a year, someone jumps. Standing nearly 80 meters high near the top of the aqueduct. Once we crossed, we went for a little walk in the woods. Ray was super excited to find what he thought was a underground piece of the aqueduct. It actually had water flowing through it. Could it be? The Town Cathedral: Next, we went to church, or in this case, the piazza in front of the church. 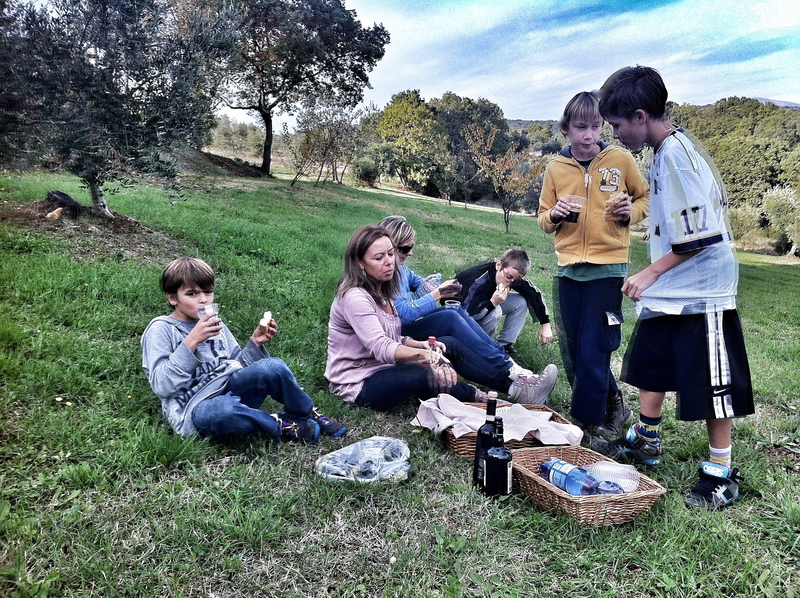 There are two things the boys really miss in the crowded, stone hill towns of Umbria: grass and wide open space. So when we descended into the spacious, sunken Piazza della Duomo, the boys took off running. 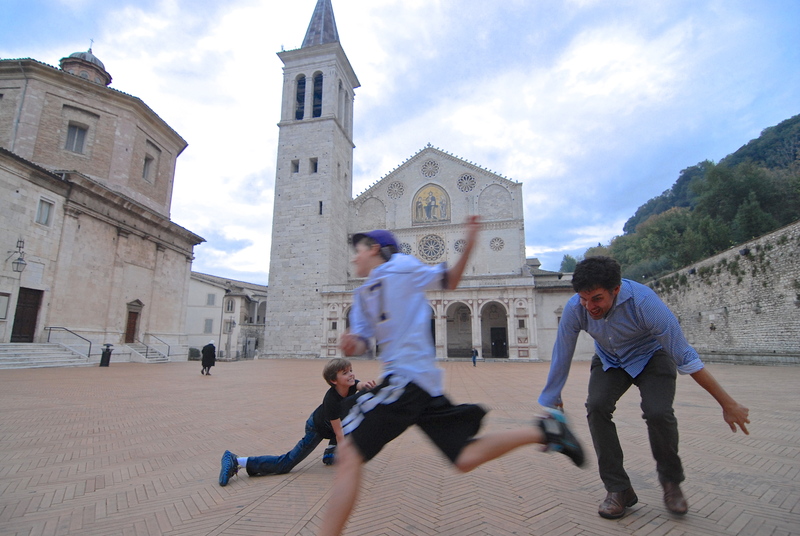 Rather than spend our time lingering over Fra’ Filippo’s famous fresco, we played freeze tag. 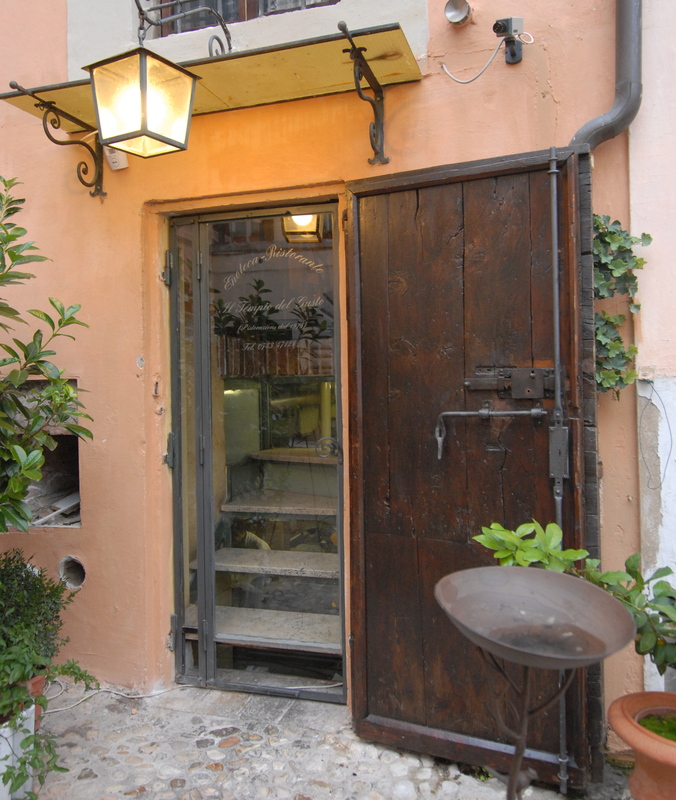 Finally, the last place we had to visit before heading back to Perugia was Il Tempio del Gusto, a trattoria that came highly recommended by a friend in Perugia. In addition to spaghetti carbonara, saffron risotto and roasted duck, we ordered a traditional Umbrian plate of cured meats, pecorino cheese, toasted breads and a sampling of olive oils. 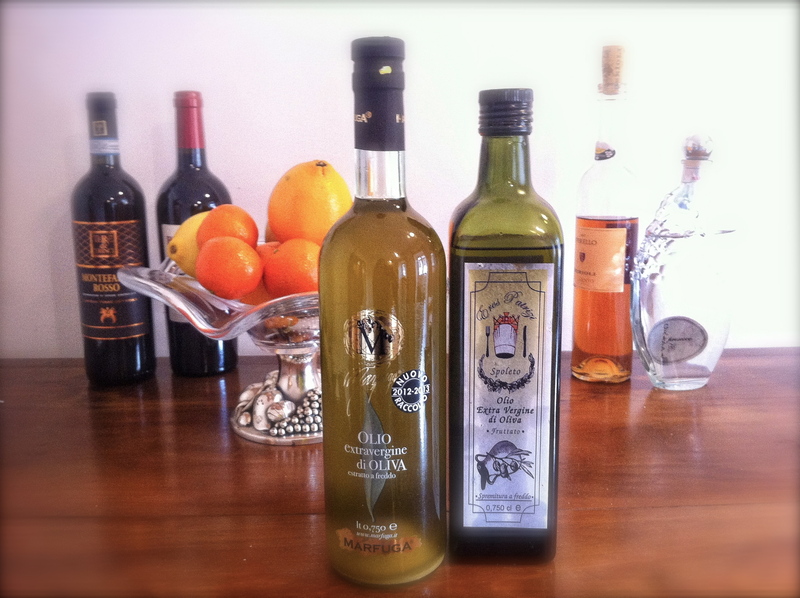 Spoleto is known for having the best oil in Umbria so before leaving, we stocked up. Since Sunday, we’ve had bread with olive oil every day for lunch. And then we think about aqueducts. 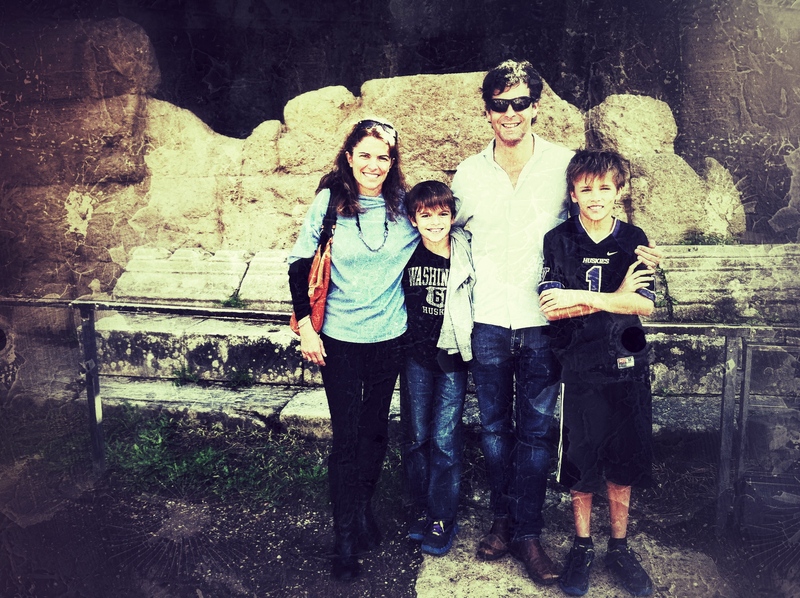 In fact, today Matt and I visited a really old one right here in Perugia. 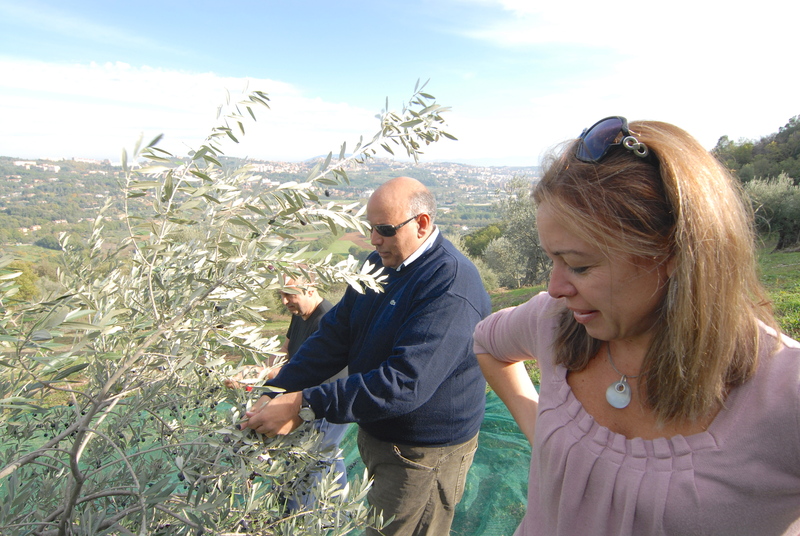 Sergio and Milena’s olive trees . . . 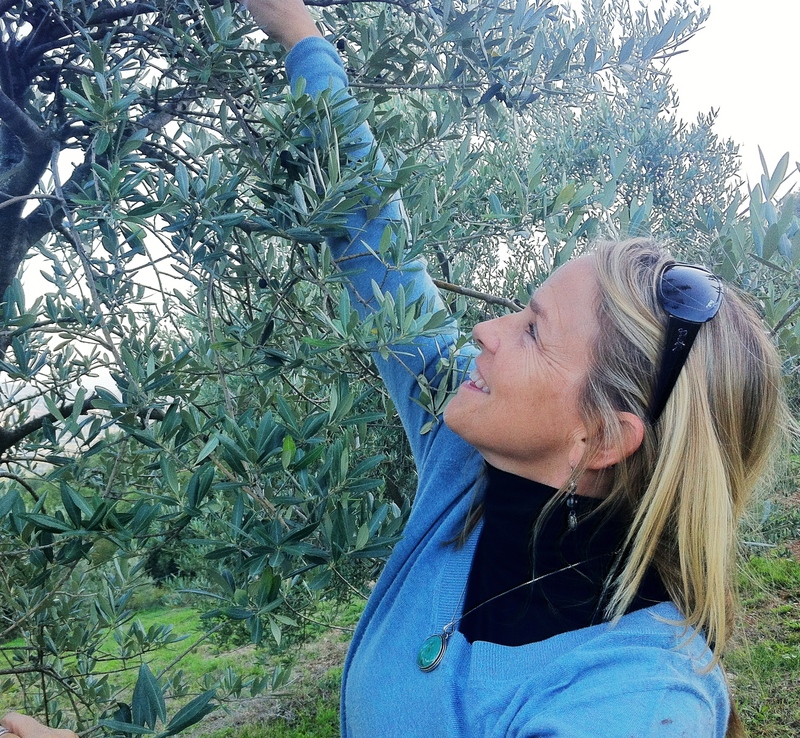 In November, Italians harvest olives. 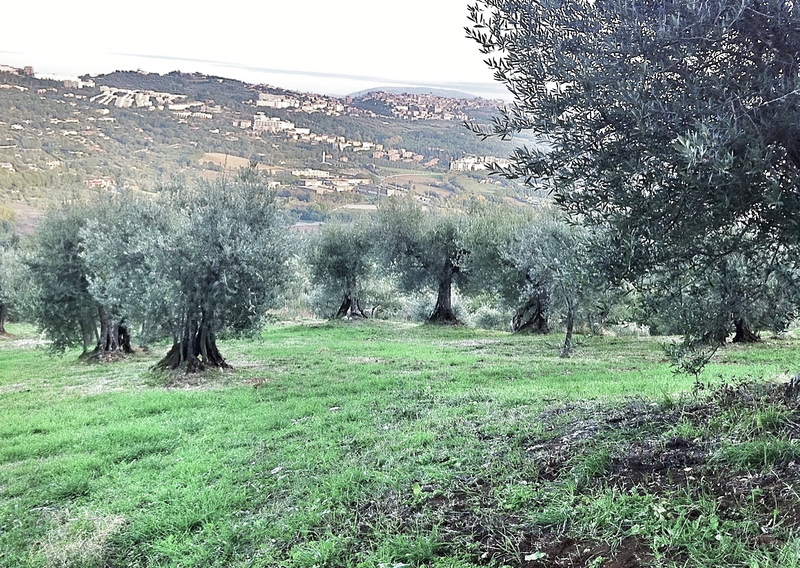 Especially in Umbria, where the weather and terrain provide optimal conditions, olives grow everywhere. 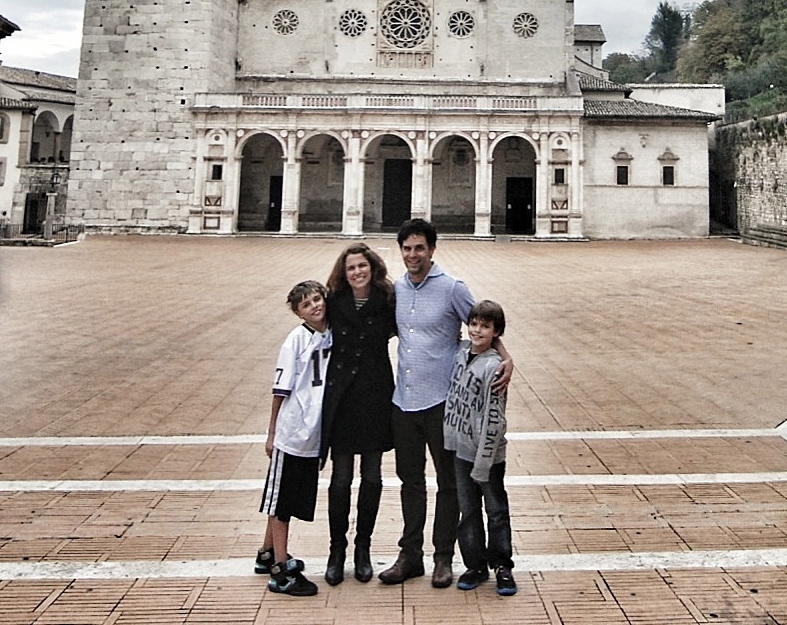 Our friends Milena and Sergio live on a hillside overlooking Perugia. They cultivate more than 100 tress. Their grove produces enough oil to last their family for a year. On Sunday, with our friend Rose and several of their friends, we arrived to pick the last of the crop and then join them for dinner. 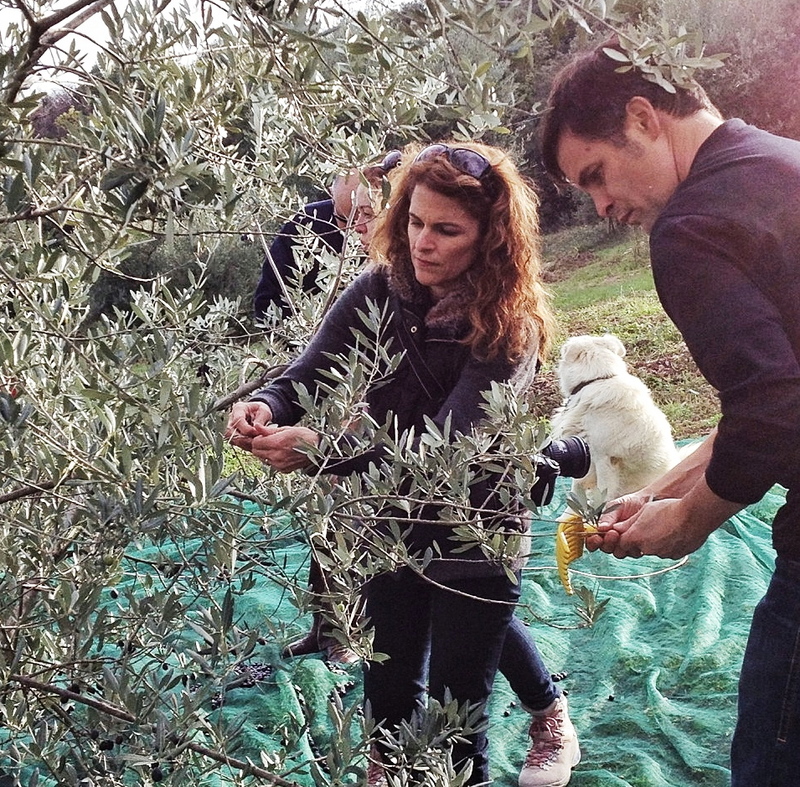 I knew nothing about harvesting olives before this day. But by the end of the afternoon, it seemed pretty simple. We began by spreading a large net around the trunk which then extended beneath the widest branches. 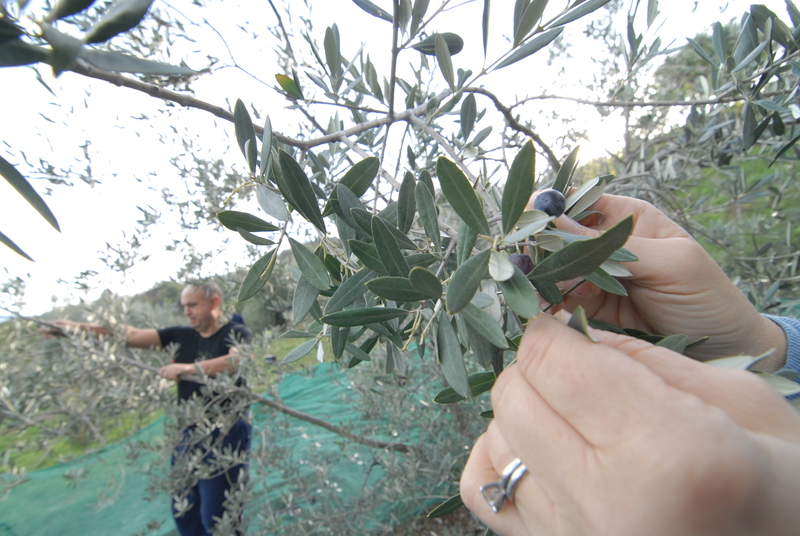 Then we surrounded the tree and picked the olives, dropping them onto the net. 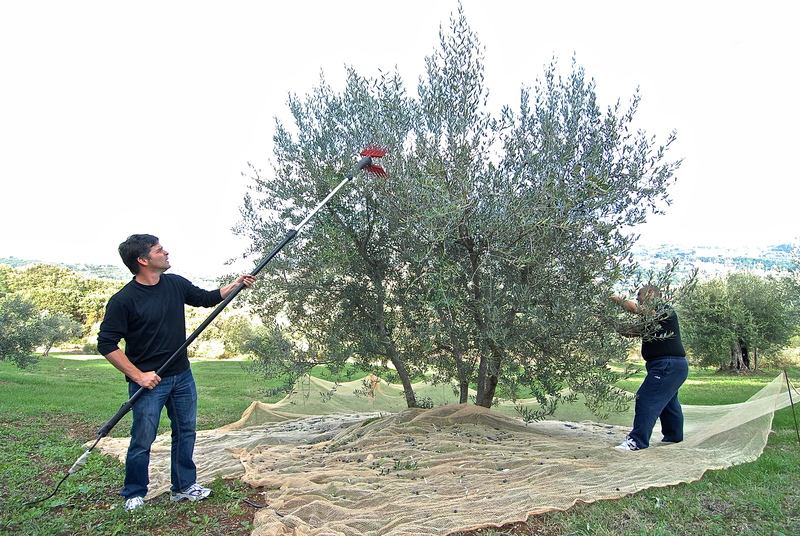 The men would take turns shaking the olives off the top with a heavy rake that vibrated with enough strength to knock them off the limbs. 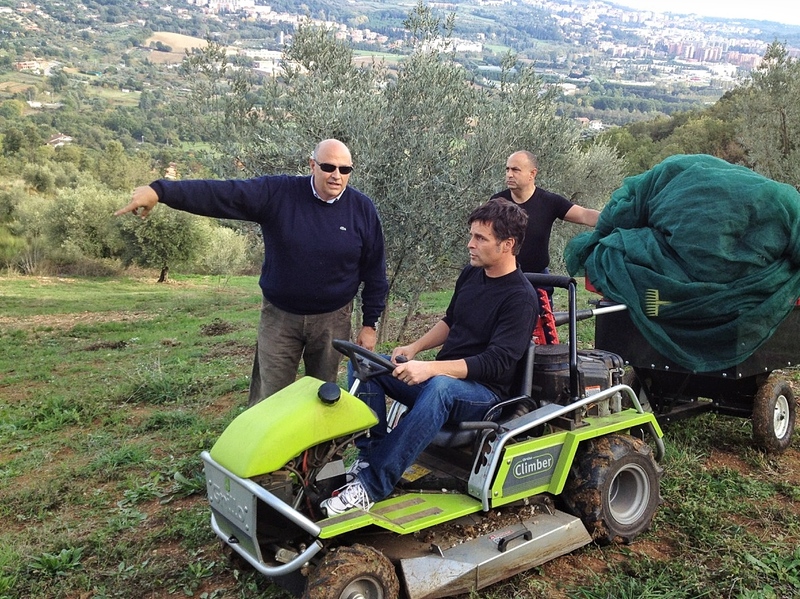 After the olives were collected, we’d transfer them to crates. Matt moves the supplies to another group of trees. We finished with the last tree just before dark. After boxing up the olives and supplies, we came inside and prepared dinner. 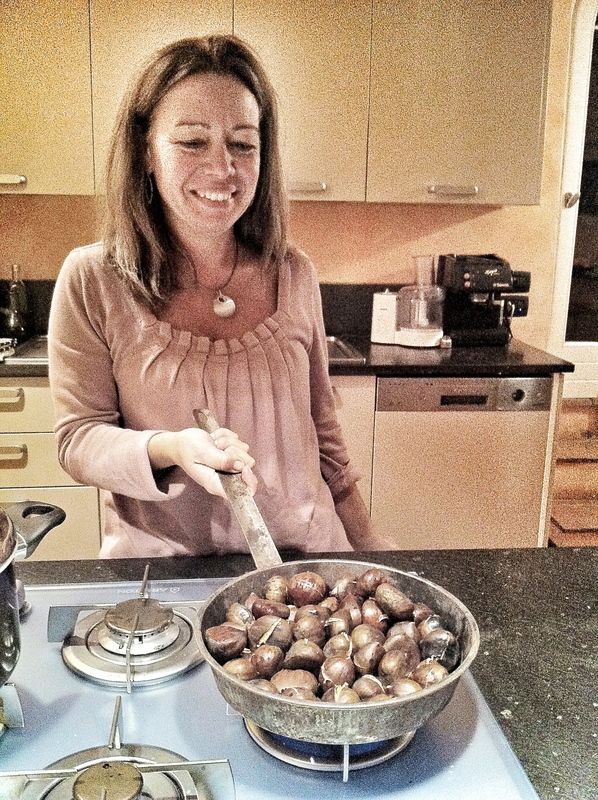 We started with chestnuts and red wine. Soon, more people showed up. By 8:30, we sat down to eat. 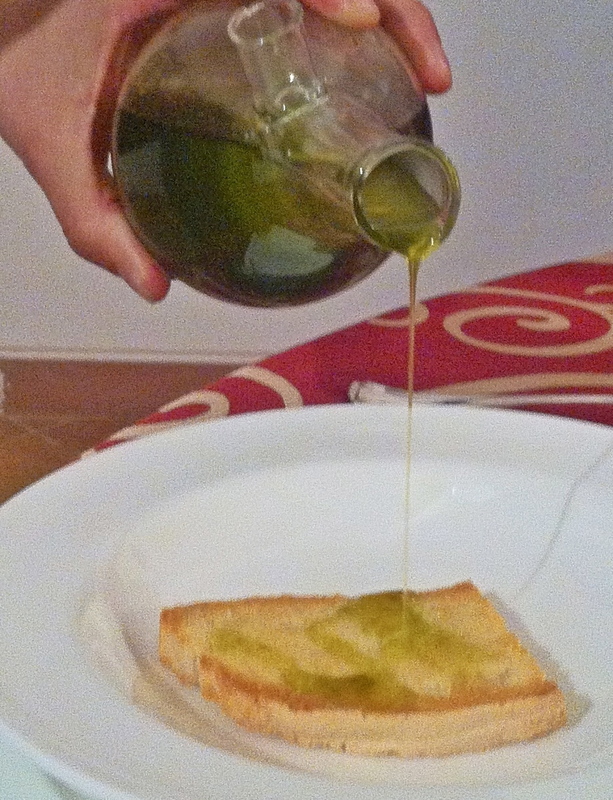 The traditional first course for a harvest dinner is grilled bread rubbed with garlic and soaked in oil. 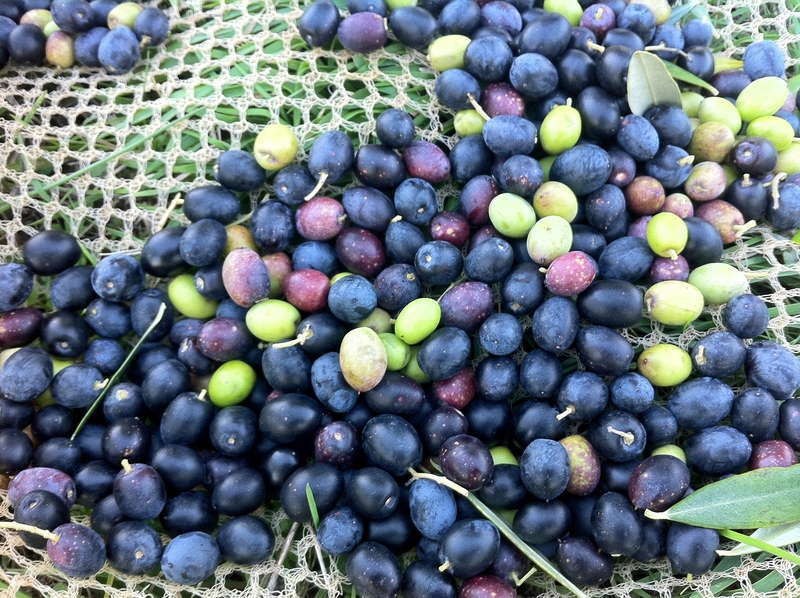 The previous day’s olives were cold-pressed for tonight’s dinner. The oil was dark green, cloudy, spicy, and delicious. Next we had huge plates of spaghetti, roasted pork, potatoes, two different kinds of salad, another chestnut course, three types of dessert and espresso. The most entertaining part of dinner was a language competition between Matt and Giovanni: Matt with Italian nouns vs. Giovanni’s English nouns. It was close. I think both men walked away feeling victorious. The end of the night: grappa, amara, and banana liqueur are served while we talked about our favorite Italian foods. The kids had their own dinner in the other room. They took breaks between courses to listen to music and dance. The Italian kids introduced Tom and Ray to “Gangnam Style.” Rose gave them a more formal lesson the next morning. (I had no idea about the dance revolution taking over the world.) By midnight we started cleaning up and then went home. 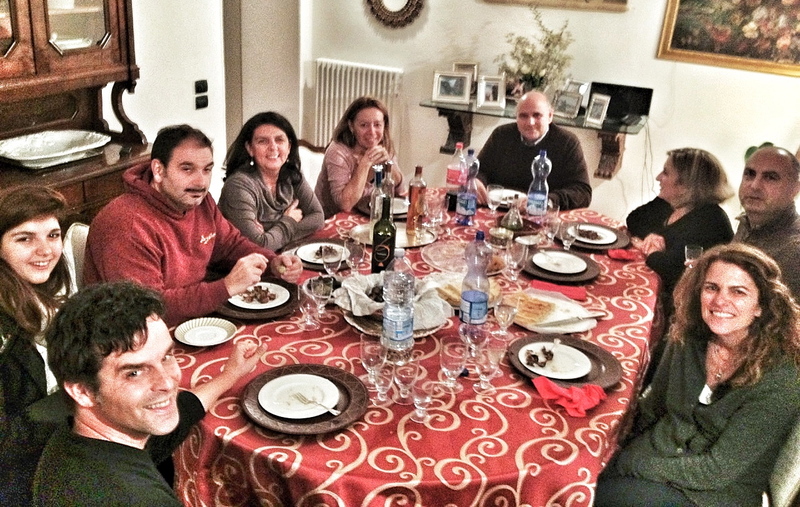 One of the guests asked how this evening’s dinner would compare to an Italian restaurant back home. We assured them it could compete with the very best. 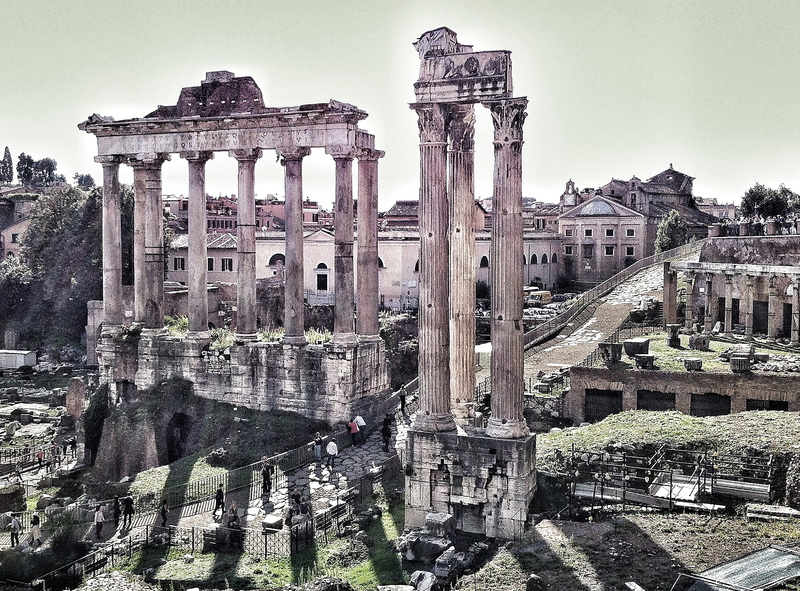 However, somehow during this visit to Rome, it made an impression on me; not in the geeky history book way or in the architectural epiphany sense, but more along the lines of sentimental. And I mean that in a good way. I was moved by the ancient lives lived in its heyday, and I was struck by the evidence of humanity and emotion. I know it’s cliché, but this monument bridged the span of time for me. I felt close to spectators and gladiators. 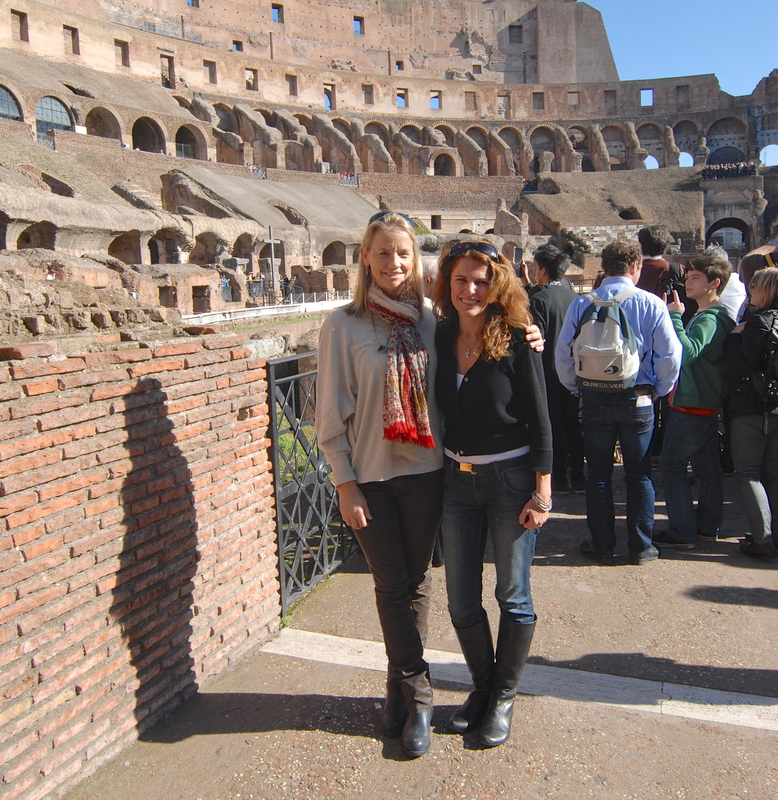 By the end of our week in Rome, I spent two guided afternoons in the Colosseum, once with my family and once with my friend Rose who just arrived from Seattle. Both times, Lucia was our guide. 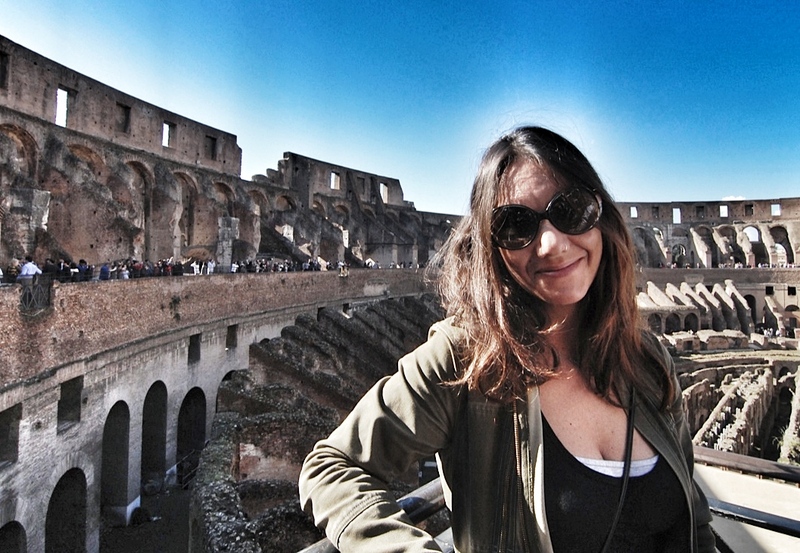 She whizzed us past long lines and into the upper corners of the Colosseum where small, preserved artifacts lay. 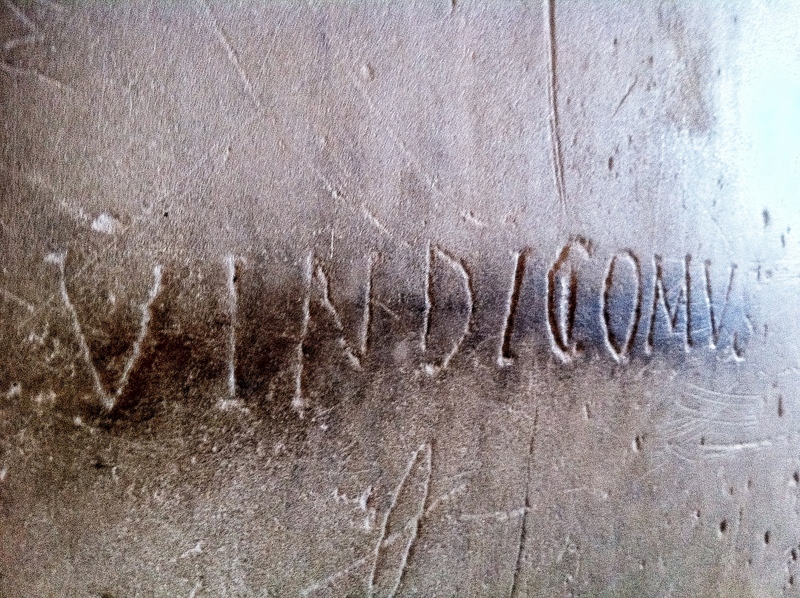 She took us to her favorite display of graffitied marble. 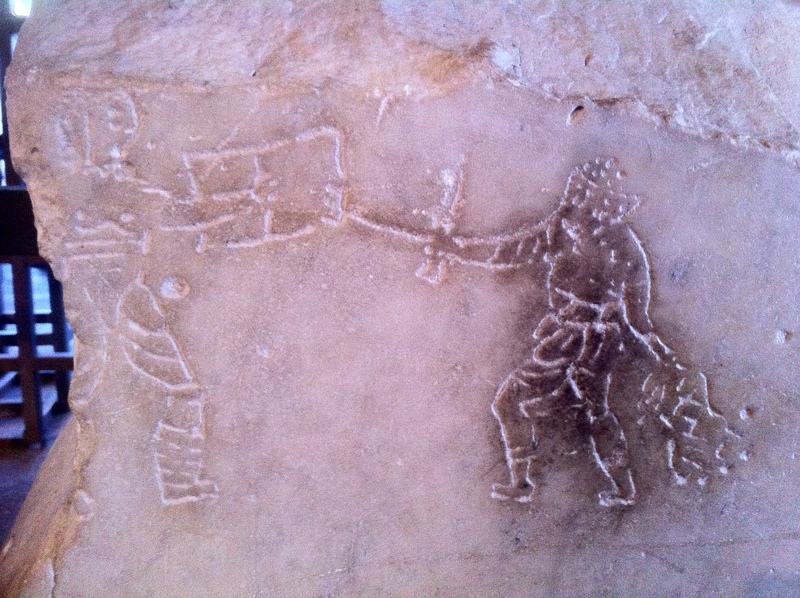 We imagined an impassioned fan carving the name of his favorite gladiator or a picture of the day’s events. While feeling a little disturbed at the sheer number of violent deaths that occurred in the arena, Lucia reminded us that life was super tough for the ancient Romans: Infant mortality rates were high, crime was rampant, and the constant conquering of territories took many lives. So the Colosseum battles simply gave the citizens a worse scenario than their own. It was entertainment. It was a show complete with scenery, trap doors and costumes. And since everyone was welcome, even women and slaves, it bonded the citizens and kept up moral. Tom said he always thought the futuristic scenario of the Hunger Games could never happen, but then he pointed out that it already had. 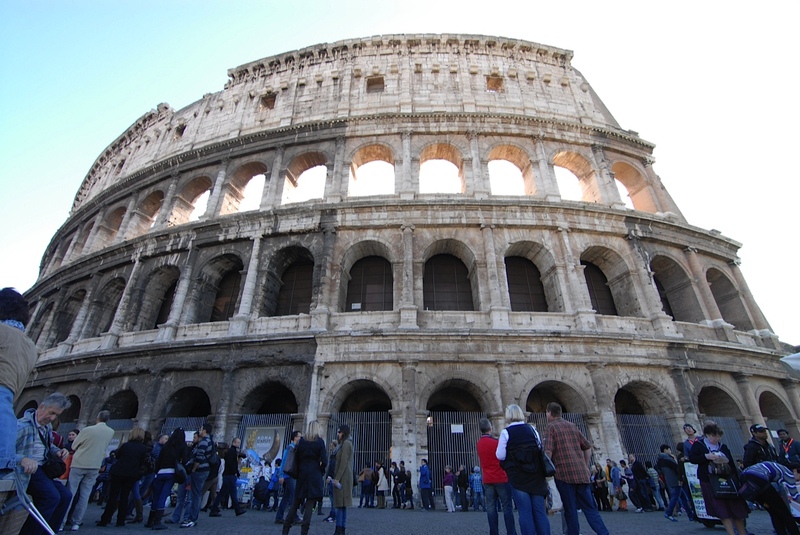 Contrary to popular belief, not a single Christian was executed in the Colosseum. The gladiators were often slaves; some had been recently captured, others were trained professionals. They would battle each other (or exotic animals) to the death. If a gladiator managed to survive, he could win his freedom and become a Roman citizen. While Emperor Commodus did participate in gladiator battles, he wasn’t killed by a gladiator. Italy sort of celebrates the Day of the Dead. 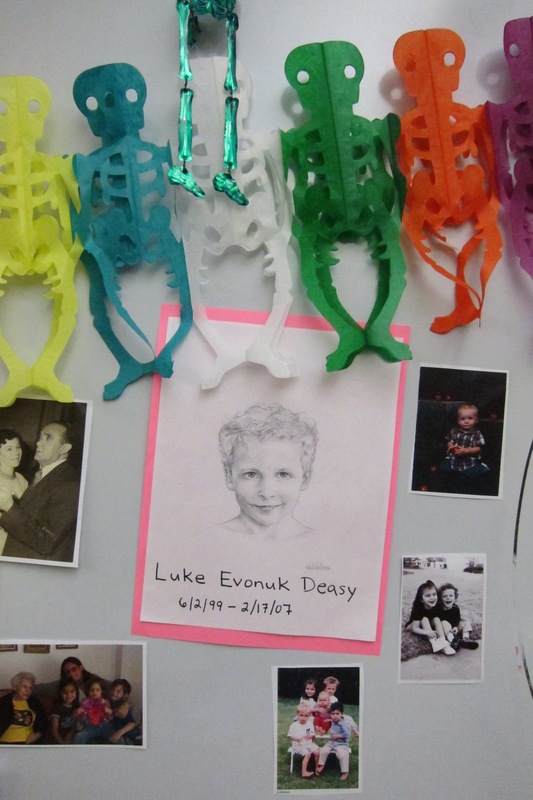 Not with the vibrant pageantry of Mexico nor in the reflective, communal way that our family has celebrated since Luke died, but it recognizes the holiday enough to give the kids a day off from school. Combined with All Saints Day, this long weekend justified a trip to Rome. So on Wednesday, we hopped on a train from Perugia. We spent Thursday counting fountains, eating gelato and dodging rain. When Friday arrived. I felt nostalgic. I knew if I were home I’d be hanging paper skeletons and lighting candles. I knew our house would be full of friends. It would feel warm, sacred and festive. Instead, it was just the four of us way over here. 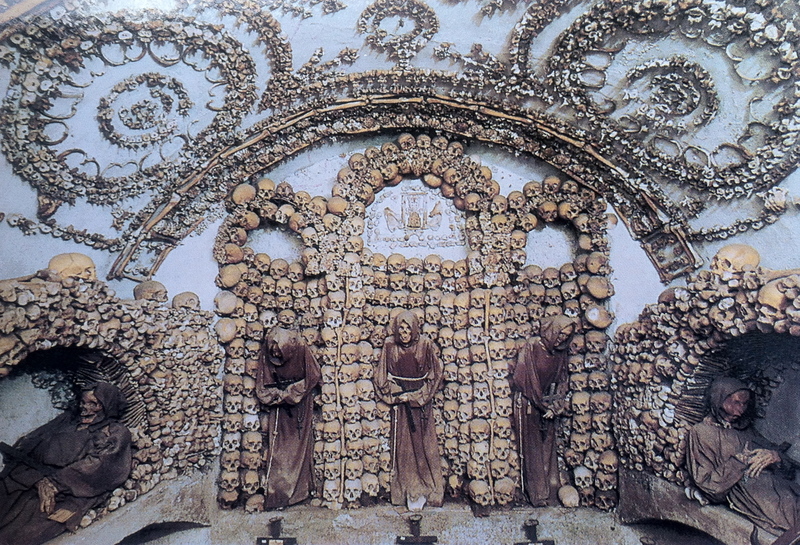 But I still wanted that lighthearted, irreverent confrontation with death and I wanted to feel a connection with those who have died, so we did our best to create an itinerary immersed in old bones. 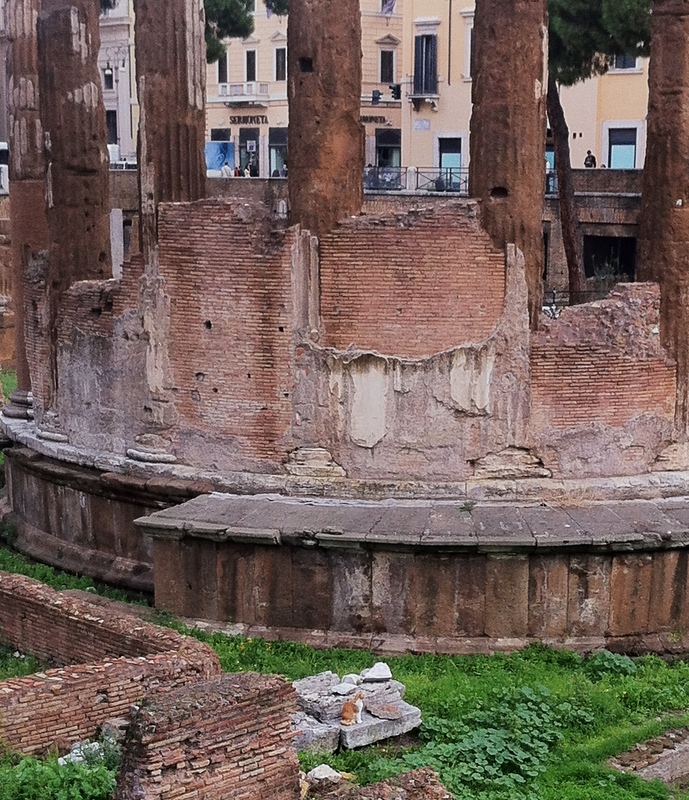 It started at the tomb of Julius Caesar in the heart of the Roman Forum. His burial site actually resembles a Day of the Dead alter; there are flowers and notes strewn on nearby rocks in honor of this Roman ruler who was killed 2000 years ago. We listened to stories of his rise to power and his betrayal by his senate friends (ex-friends, I guess). Later, we walked to the site of his assassination. It’s adjacent to the famous Cat Sanctuary. For a price, you can adopt real Roman cats which are believed to be reincarnations of the ancient emperors. Hundreds of cats roam the ruins while a group of volunteers takes care of them. There’s a little yellow and white emperor under the temple. Caesar was stabbed somewhere in this scene. The lighting was much better in person: orangy and atmospheric (not that anyone could ever feel “cozy” in here.) I wish you could see the entire ceiling in these pictures. 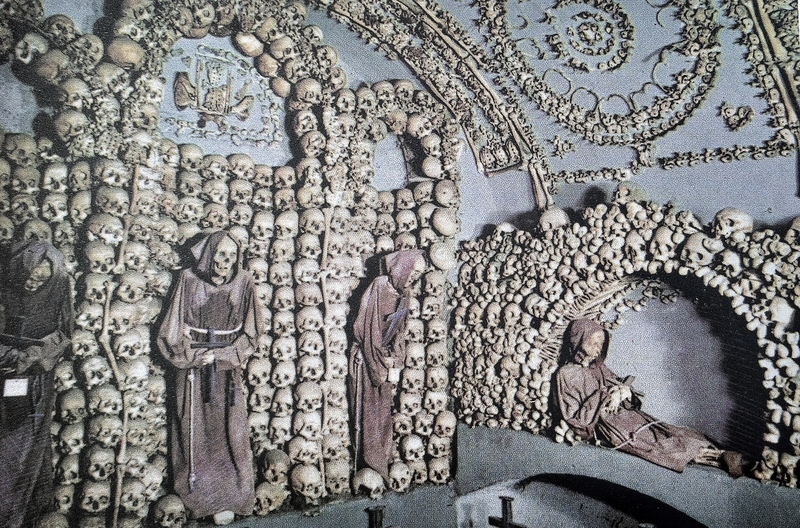 As we were looking around, someone told us the crypt was closing early. 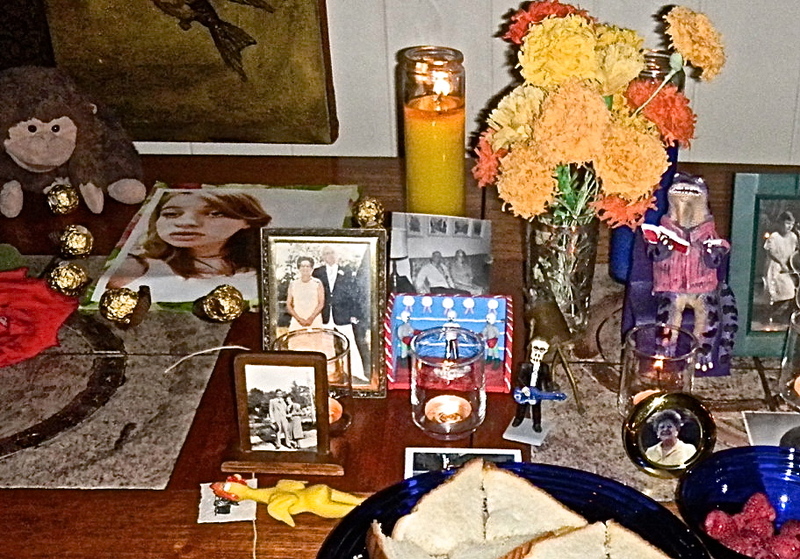 She told us that once a year, on the Day of the Dead, a mass is celebrated among the bones, and we were welcome to stay if we wanted. I couldn’t believe our luck. Tom and Ray saw it differently, though, so they chose to get gelato and take a walk with Matt while I joined about 20 live Italians and 4000 dead monks for a short service. 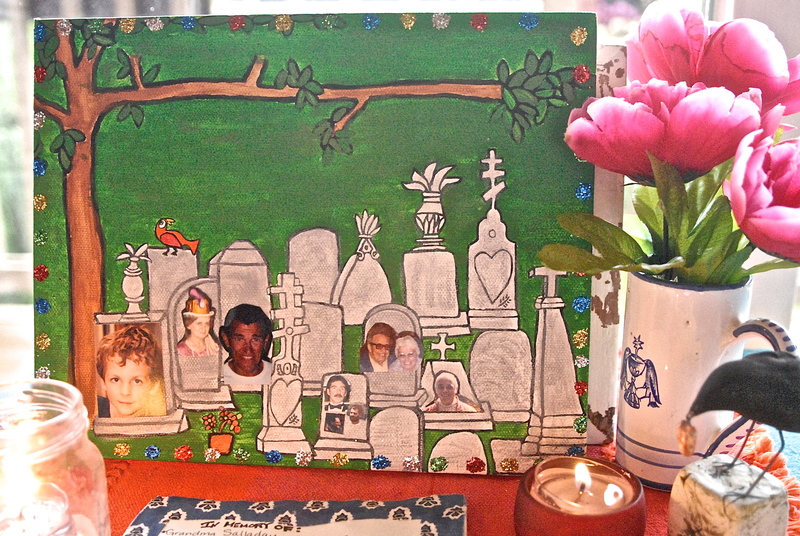 Later on, after we returned to our hotel, I received several emails from friends at home who were making alters, remembering people who died and keeping the spirit of this holiday strong.